TORONTO - North American markets were mixed Tuesday while the Canadian dollar was sharply lower amid a slide in commodity prices. 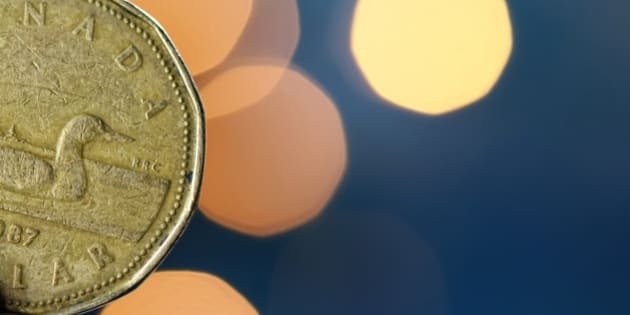 The loonie, which closed at 83.18 U.S. cents on Friday in advance of the Victoria Day holiday weekend, plunged 1.43 U.S. cents to 81.75 cents. The fall in the loonie came as the June contract for benchmark oil fell $2.17 to US$57.26 a barrel, continuing a slide that began a week ago after its most recent foray above US$60 a barrel. Meanwhile, June gold gave back $20.90 to US$$1,206.70 an ounce, while July copper was down seven cents at US$2.84 a pound. On equity markets, the Toronto Stock Exchange edged up 12.90 points at 15,121.02. New York markets were mixed with indexes moving in a narrow range amid optimism over the latest read on U.S. housing construction but disappointing earnings news from Wal-Mart Stores Inc., the world's largest retailer. The Dow Jones industrial average moved further into record territory, rising a slight 13.51 points to 18,312.39 after a record high close of 18,298.88 on Monday. The S&P 500, which also set a record high of 2,129.20 on Monday, gave back 1.37 points to 2,127.83, while the Nasdaq fell 8.41 points to 5,070.03.